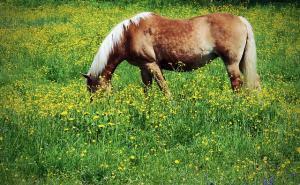 Just like cats and dogs, horses are susceptible to a range of allergies. With summer approaching, it is important to think ahead and get these allergies under control before the season starts and the problems worsen. Sunshine and warmer weather make life much easier for the horse and horse owner, but they also bring flies, pollen and poisonous plants with them. The most common types of allergy affect the respiratory system and skin, and these can be triggered by a range of allergens from dust and pollen to bacteria. Allergies to pollen and dust (found in hay, straw and stables) can cause respiratory difficulties, prompting symptoms similar to those seen in human asthmatics. Allergy-related respiratory problems are scientifically referred to as chronic obstructive pulmonary disease (COPD). They are easily triggered by airborne irritants that cause narrowing of the airways and lead to coughing, wheezing and gradual loss of performance. To avoid allergies, bed your horse on shavings, shredded paper or rubber mats rather than straw. Keep stables clean, mucked-out and well ventilated. Feed dampened mixes and a hay alternative i.e. grass. Read our related blog post for more information on respiratory problems in horses. Skin allergies are another common problem as we head into summer. One of the biggest culprits for triggering these is flies. They are every horse owner’s nightmare and, come June, flies and midges are out in force. The weather starts hotting up and horses are turned out 24/7 to make the most of the glorious sunshine. But being outside means flies. Everywhere. Biting flies, horseflies, feeding midges, you name it; horses are being affected by it. Apart from being obvious nuisances, flies carry diseases and trigger allergic responses through their secretions. Biting flies pierce the skin and transmit toxins, sending the immune system into overdrive. Sweet Itch is a debilitating condition caused by the saliva of the Culicoides midge. In some horses, the protein components present in midge saliva trigger the over-production of histamine, resulting in inflamed and itchy skin that is easily broken. Once Sweet Itch has taken hold, treating the condition and bringing effective relief is difficult. The more a horse itches, the more it rubs and bites itself, and thus the more it itches. When it comes to Sweet Itch, the best method of defence is prevention, although no measure is entirely fail-safe. VioVet sells several fly rugs, including the Z-itch rug with hood that not only protects against midges but absorbs powerful UV-rays and allows air in to circulate, keeping your horse at a comfortable temperature whatever the season. The rug also incorporates a mesh eye section, is fully-adjustable and is machine-washable for convenience. Ensure the rug is worn now and in the lead up to summer, before signs of Sweet Itch appear. Putting a rug on once lesions have developed is futile as your horse will continue to itch itself, only destroying the rug in the process. Insect bites and food allergens can also prompt allergic reactions in the skin, which usually show up as hives. Mosquito bites and gnat bites are particularly common triggers, although reactions tend to clear up themselves without any intervention. In severe cases, corticosteroids may be prescribed to help treat the allergy and protect the skin. Common food allergens include grains, hays, nutritional supplements and certain feeds. Besides skin symptoms, your horse is likely to display gastrointestinal problems every time it eats the offending ingredient. If you suspect your horse has a food allergy, it is important to get vet advice and try elimination diets to determine what is causing the reaction. Flies can also be responsible for transmitting tumours especially where there is an open wound or even a small cut. Great care should be taken to protect any broken skin.